You cannot delete a user account once it has been created, but you can inactivate the user account so that the user cannot log in to Dentrix Ascend. Set the Active switch to No. 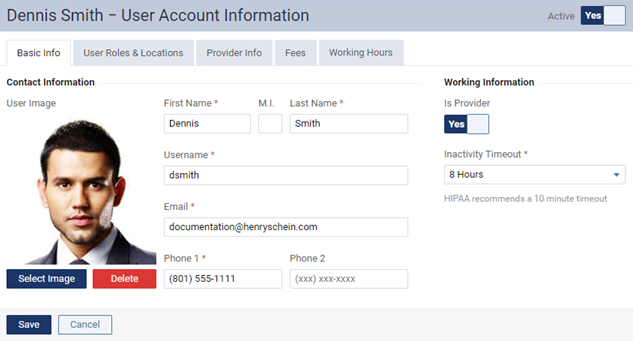 Tip: Whenever you modify a user role, Dentrix Ascend automatically sends out an email message to every affected user's account, including inactive ones. To prevent Dentrix Ascend from sending out email messages to inactive users by having user roles that you will most likely modify assigned to both active and inactive user accounts, you can create a user role without rights to access anything (which you would most likely never need to change) and then assign that role to a user account when you are inactivating it. When you make a user account inactive and, at the same time, change the associated roles for every location that the user has access to, the user will receive only one email message that his or her user account was changed. You can change the roles for a user account on the User Roles & Locations tab. If the user account is for a provider, follow the instructions for inactivating a provider. Note: You can view inactive user accounts in the user list on the User Accounts page by setting the Include Inactive switch to On.